BOOK 7 NIGHTS OR MORE, RECEIVE 20% OFF NIGHTLY RATE! YAY!!!!! 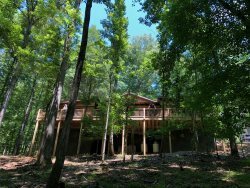 One of the best cabin rental deals in North Georgia! When you book seven nights or more in one of our fantastic and comfy cabins, you will receive 20% OFF of the nightly rate. That adds up to big savings that you can use to satisfy the foodie within and maybe even get some of that shopping done in the extraordinary shops of Ellijay and Blue Ridge. Don't wait another minute. With a deal like this, cabins won't last! Book now and get ready to vacation in the Mountains. :-) Note: Your discount will automatically be calculated when you enter five nights or more for your stay. Does it get any easier? I think not! Limitations: this offer cannot be used with any other discounts or promotions. We offer a 10% discount for all branches of our valiant Armed Forces, and we extend that discount to all Civil Service employees for our Police, Firefighter and Teaching fields. Please accept our gratitude for everything you do!